NOTE: This wonderful company performed The Mystery of Edwin Drood at SOPAC last summer and A Little Night Music at Morristown Beard School the summer before that. Don’t miss this production. My friend Ken Magos is playing Sweeney Todd and he’s fabulous! Tickets are available for purchase HERE or by calling (973) 313-2787. 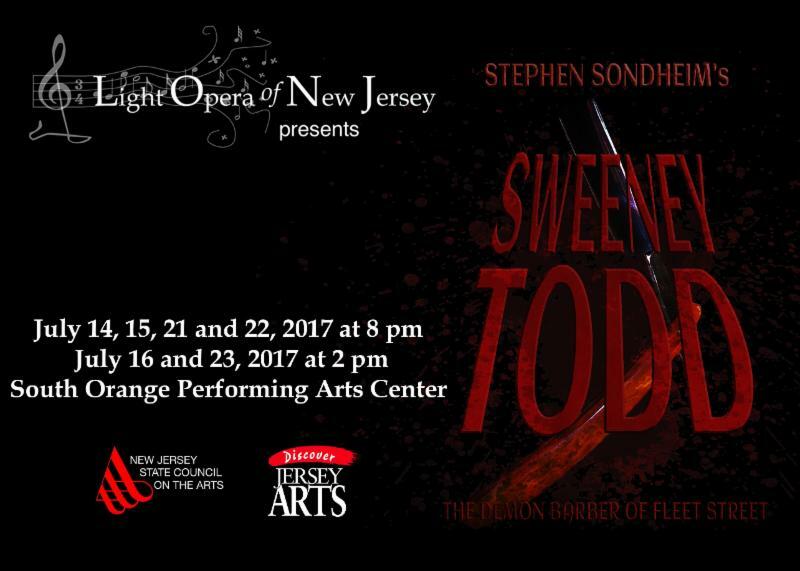 To close our 22nd season in the summer, LONJ presents Stephen Sondheim's dark-humored musical thriller, Sweeney Todd: The Demon Barber of Fleet Street, directed by Jeffrey Fiorello with music direction by Stephen Fox and choreography by Samantha Hahn Simpson. Returning from exile, Benjamin Barker arrives in London under the name of Sweeney Todd in order to exact his revenge on the judge who exiled him in order to steal his wife. Todd resumes his old residence in his barber shop over the meat pie establishment of Mrs. Lovett. A competing barber, Adolfo Pirelli, recognizes Todd and threatens to reveal him to the authorities, causing Sweeney to kill Pirelli in a rage. When Mrs. Lovett discovers the body, she proposes disposing of it through her meat pies as she hasn't been able to afford real meat for weeks. Todd and Lovett continue to plot together, throats are slit, and business begins to flourish. Can Todd be stopped before exacting his revenge on the judge? Join us for Halloween in July at SOPAC!